Her first words are ‘Lola, Lola, Lola’. It best be ON while she’s chowing her granola. It’s exclusively Lola, all other toys are poo-pooed. For sliding, and swinging, and fresh air..? GOD FORBID you touch the remote. Change channels and she’ll punch you in the throat. It’s been a long day of Lola varieties. hehe! It could have been much worse! 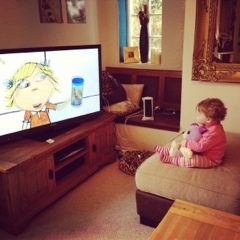 She could have been obsessed with peppa pig (now that really would be something to drink about)!! Ha ha I have the same problem with Baby Jake! Cute! I love Lola! Me and my eldest are so old we had read the original books before they even made the TV series! For years Charlie & Lola was the only thing all of my kids would watch in the car without arguing. I also love Peppa Pig. Should I get out more?! Aww bless her! Great poem, I love it. It has to be said, of all the kids programmes these days, I prefer watching Charlie and Lola to most of the others! 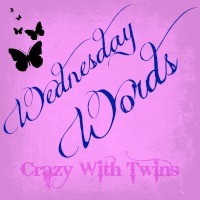 Thanks for linking up to Wednesday Words – sorry I took a week to comment – not feeling my best. This weeks is now up if you have a new entry.